For many people Burgundy is still the place to be for pinot noir. Some of the supposedly greatest wines in the world, think Romanée-Conti or Laurent Ponsot, are produced in the region, which unfortunately leads to scarcity and increased overall price levels. Therefore, I would like to turn today’s spotlight on pinot noir in other parts of the world.Oregon is hip, New Zealand is becoming a classic but they remain expensive, especially given the weakening of the euro, meaning I would have to at least take the currency risk out of the equation. The best place to end up then is without a doubt Germany. I recently participated in a Pinot Noir vs. Spätburgunder (the German name of PN) tasting at one of Belgium’s best Burgundy importers, Epivino. 16 wines tasted in pairs, all blind until the final reveal. It was one of the more interesting experiences that I participated in in recent times. The key takeaway was that it is becoming increasingly difficult not only to distinguish the wine’s origin but also its intrinsic quality. One of the top three wines was a Spätburgunder, one that I had in the cellar myself actually, and I did manage to correctly identify seven out of eight pairings but to really say that Burgundy stood out as the top region for pinot noir was simply too difficult. What I tend to look for in Spätburgunder is openness, a sense of clarity that is often lacking in (young) Burgundy in the more affordable price range. To some it may simplify the wine but I would dare to say that you end up with a joyful wine that does not necessarily require an intellectual analysis in order to be appreciated. While Burgundy still reigns supreme when it comes to elegance and finesse, Spätburgunder can be the more pleasurable experience. 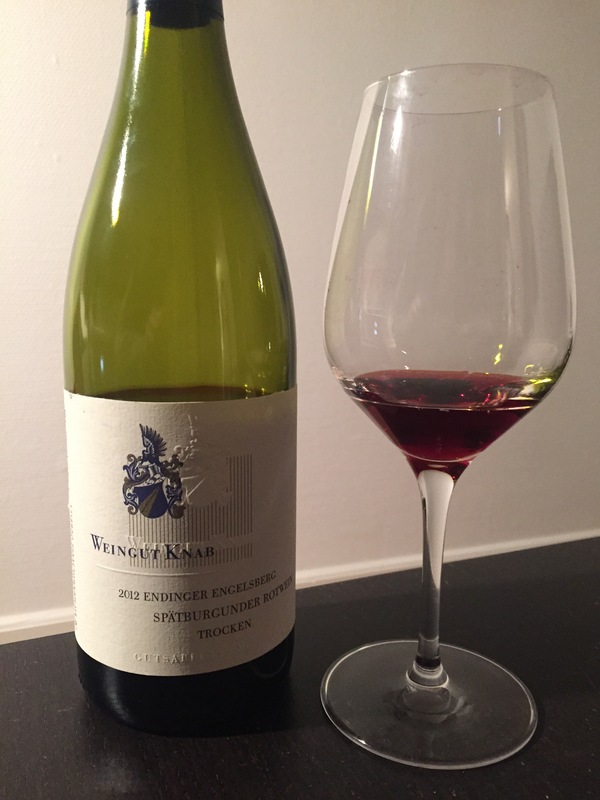 The Ahr and Baden are the places to be for Spätburgunder and I’ll focus on the latter with Knab’s Endinger Engelsberg 2012 Eichenholzfass. Known for being the warmest region in Germany, Baden is home to all great pinot varieties and some of the most renowned producers own land around Kaiserstuhl. Thomas and Regina Rinker purchased the Knab estate in the early nineties after the original family had no interest in continuing. The focus on quality has paid off seeing as the estate is now a well-regarded classic in the region. The wine was aged in big barrels, over 60 years old, with the purpose being softening of the wine instead of adding oaky aromas and structures. On the first day it was quite open on the nose but a bit too tight in the mouth. A bit musty, hints of coffee as well but when re-tasted a day later it’s much more conforming to expectations of spätburgunder, fresh red fruit, cherries and little strawberries. Very pure in the mouth, a little bit of earthy minerality and freshness that continues throughout, well-supported by a more juicy structure that is present but not overbearing. Great drinking pleasure which may be deceptively simple at first, but which will surely provide a lot of no-nonsense pleasure!